I am of a mixed mindset when it comes to drone use in photography and videography—on one hand I think that these platforms for aerial work are a doorway to a whole new market and new revenue stream, but on the other hand I think that the technology has the power to be both overused and invasive. Make no mistake, though, drones are here to stay, and their creative use can be a boon to the responsible creative who wants to integrate imagery from a vantage point simply unavailable on the ground. In some markets (real estate, travel, event and, eventually, virtual reality), the use of a drone will enable a photographer to enter a place previously only the realm of the private pilot. From toy drones found at Brookstone to professional cinema-rig models used at major sporting events, the breadth and scope of the drone market is starting to become a bit off-putting. It’s hard to know how much to invest in a drone when one is unsure of how much revenue it will bring. Because of the excellent quality of the 4K video on the DJI Phantom 4, some of the best still images the system produces are frame grabs from video. Fortunately, the sophistication of technology at the “entry” level of the spectrum is now good enough to allow photographers and videographers to dabble in drone work without breaking the bank. While full-fledged rigs designed for cinema or DSLR use can cost upwards of $30,000, companies like 3DR and Phantom produce drones with integrated cameras or the ability to use an action camera (such as a GoPro) for closer to $1,500. With a price point this low, it’s easy for a photographer to dip their toe into the world of drone content creation, and with that in mind I recently took the DJI Phantom 4 out for a spin. The (as the name implies) fourth version of DJI’s consumer-facing drone is packed with sophisticated features and a camera that can capture both 12MP stills and UHD/4k video at up to 30p. Despite the (relatively) low price, the Phantom 4 is an incredibly sophisticated device. Built-in sensors allow the drone to avoid obstacles automatically (when flying forward, more on that in a moment), launch and return home automatically, and safely return to a user when radio contact is lost or when the battery is low. The drone’s 3-axis stabilization means it creates butter-smooth video and can even capture HDR images while hovering in flight. The software runs on iOS or Android, providing a large, clear look at the camera’s HD feed and more than enough room to control the various systems. For shooters who are looking to document job sites or public spaces, the DJI Phantom 4’s software allows for it to follow a predetermined course laid out by touching points on an online map. It can even visually lock onto a target and follow the subject around—perfect if you’re trying to document a mountain biker or other moving target. Besides photography and videography, the Phantom 4 has some practical uses as well. I was able to send it up to examine my chimney after some bricks fell from it—something that otherwise would have required ladders and some precarious balancing. It’s much nicer inspecting a roof from the safety of the ground. An iPad or Android tablet sits on a stand on the controller and connects via a USB or Lighting cable. The remote control is the primary flight surface, and it’s even possible to fly and use the Phantom 4 without the tablet, but you would have to guess what the camera was pointing out, and you wouldn’t, naturally, be able to use features like map-based navigation and subject tracking. The controls are very sensitive, and I recommend using the drone for the first time in a large, open space, like a public park where drone flights are allowed. On my first test of the drone, my son tried to “help” me fly it and drove it sideways into a bush, where it hovered after he let go and proceeded to cut leaves off until I could back it away. Had the drone been facing toward the bush, this wouldn’t have happened—it would have stopped short of the object, but it was accidentally flown sideways. Once you know how to use the drone, though, it quickly becomes second nature. I found myself able to leapfrog obstacles just watching the drone fly though the sky. The 4K video off of the Phantom 4 is excellent, though it does suffer a bit from stuttering video recording if you pan the drone faster than the camera can keep up. I wish there were a “spin the drone slowly in 360º button.” I found that activating the drone’s video capture and then having it move from one waypoint to another created butter-smooth video, however. Note: The YouTube video is in 4K resolution, but some browsers may play this video in lower quality and may create moire when playing back the full 4K when embedded an article. To see the best quality video playback, click the YouTube icon to view this on the YouTube site, and select the highest quality video. There is only one lens focal length and only one ƒ/stop, which can be extremely limiting. I didn’t have the accessory-neutral density filter, so many of my shots with bright setting sun over a river valley, for example, were blown out, even when shooting in HDR. It’s very helpful that exposure point can be set on the fly, but only in the same way that it’s helpful that you can set the exposure point on a smartphone—if the sensor can’t handle the dynamic range, setting the exposure point just determines what’s less likely to be lost. I’d also like if the aperture weren’t ƒ/2.8. It makes the drone much more useful in low light, but it means that there is going to be some detail lost at depth—and if I’m flying a drone, I want to have a vast, unfettered view. That said, the images and video from the DJI Phantom 4 are breathtaking when the light is good. There is a richness and vividness of detail, and the viewpoint from 100 meters up is hard to beat. Since the sensor captures a 12MP still, and 4K video frame grabs create 8MP images, I often prefer capturing video and grabbing still later—especially when I’m looking for a photograph that shows a wide field of view. 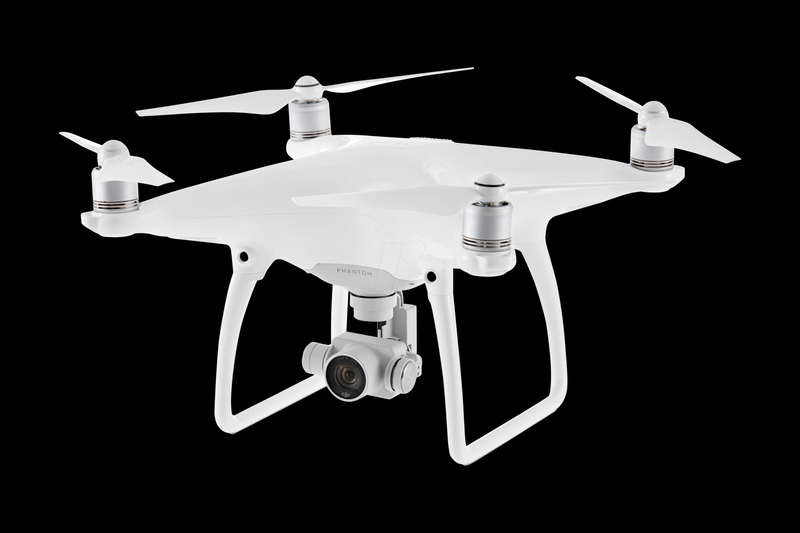 If you’re interested in drone photography and videography, you’d be hard pressed to find a better starter device than the DJI Phantom 4, especially when you consider that just a few paying jobs would be enough to pay off the $1,200 entry price. While the stills from the Phantom 4 are beautiful, they are not as detailed as the frame grabs from 4K and are often under or overexposed due to the small dynamic range of the sensor. Excelente abordagem de detalhes que para uma melhor qualidade de imagem, ainda é melhor aguardar um pouco mais para o aumento da faixa dinâmica do equipamento que vem nesses drones.